Egypt’s Assistant Defense Minister Ahmed Wasfy praised the British military forces who took part in a joint Egyptian-UK training titled “Ahmose-1” which concluded on Monday, adding that he looked further to future joint drills. Earlier in March, “Ahmose-1” was launched for the first time at the Mohamed Naguib military base in Egypt and in other areas within the northern military region, featuring the participation of Egyptian and British ground troops. The final stage began with a detailed explanation of the tactical plan and the topographic nature of al-Bayan area, where the exercise took place. The exercise was for the infiltration of an armed terrorist outpost in a residential area with the aim of eliminating the terrorists with the participation of both air forces and troops, before deploying medical teams and morale teams to reassure locals, re-operate suspended facilities, and restore aspects of normal life in the area. Military spokesperson Tamer al-Refai said in a statement on March 7 that British forces had arrived at the Egyptian air bases and seaports over the past few days. 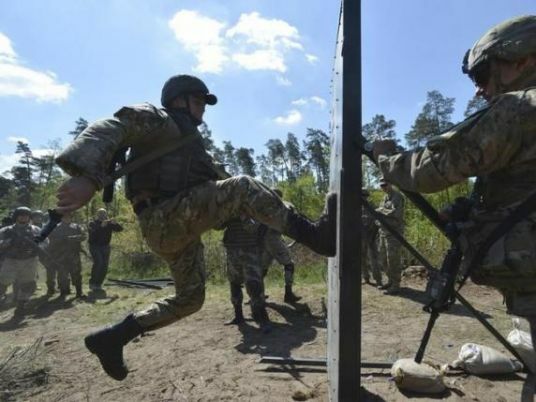 He added that the training included various exercises and activities in firing techniques, fighting in cities, and combating terrorists. Refai said the training aims at developing and enhancing military relations, exchanging experiences and developing the force’s skills in counter-terrorism while using the latest technological means. Previous stages of the drill included raising combat readiness, preparation and organization to carry out the planned military activities, which began with the integration of forces participating in the drill from both sides, training on dealing with IEDs, fighting in cities during the day and night and finally implementing many individual exercises with live ammunition.